Stapleton-Spence Packing Company completes largest solar water heating system in the State of California. The new solar thermal system includes 20,000 square feet of solar panels on the roof of the processing facility. Stapleton-Spence’s fruit processing and co-pack facility has the largest solar water heating system ever installed in California, saving the company 37,584 therms of natural gas annually. 37,500 therms is equivalent to 1 million kWh or a carbon footprint offset of 1.4 million pounds of CO2, the equivalent to 2,000 cars annually, sources say. 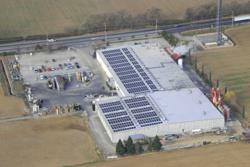 The new solar thermal system includes 20,000 square feet of solar panels on the roof of the processing facility. The sun is used to pre-heat well-water that flows through the tubes of each panel. About 650,000 therms of natural gas are used at the Gridley plant each year, primarily to rehydrate dried fruit, and sterilize purees and juices before packing in airtight containers. “We use the solar thermal system to pre-heat well-water before it enters our boilers. Our specialty is applying the right amount of heat to sterilize food products and then to pack in containers that maintain the sterile environment. This lets us preserve foods without chemical preservatives", says Brad Stapleton, President of Stapleton’s. Stapleton’s uses about 30 million gallons of water per year, with about one third of that going to the boilers. Well-water is pre-heated by the new solar system and is sent to the boilers approximately 30 degrees warmer, where the boiler does the remainder of the heating. Being good stewards of the environment isn’t new for Stapleton’s. “We have a 2 million gallon on-site water treatment plant that’s been active since 2000,” says Mr. Stapleton. Stapleton’s uses about 30 million gallons of water per year, with about one third of that going to the boilers. Well-water pre-heated by the new solar system and is sent to the boiler approximately 30 degrees warmer, where the boiler does the remainder of the heating. The solar water heating system was installed by FAFCO and BCM Construction. Stapleton-Spence Packing Company is a leading packer of prunes, prune concentrate, prune juice, packaged prunes, bulk prunes, canned prunes, plum puree, a full line of nuts, raisins, pineapple juice, cranberry juice cocktail and other juices per customer requests. Stapleton’s offers copacking services including packaging, bottling, canning, pureeing, concentrating, aseptically packing, roasting, salting and flavoring nuts, and recipe research and development. Headquartered in San Jose, with a processing facility in Gridley, California, Stapleton-Spence is a family-operated company in business since 1951.